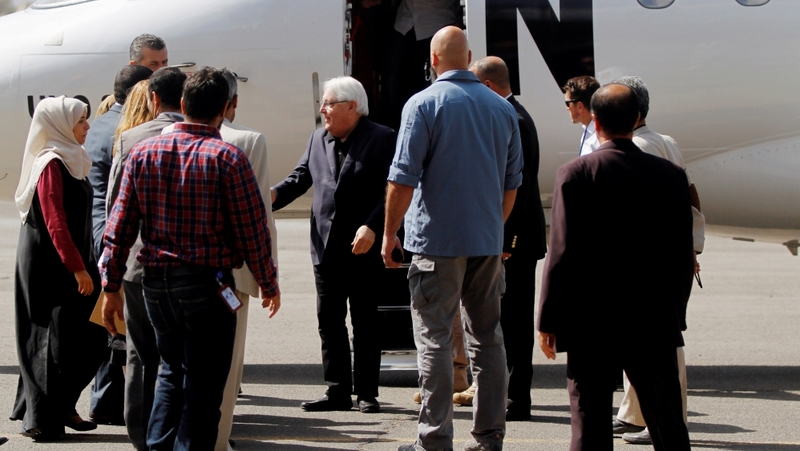 Martin Griffiths, the United Nations envoy for Yemen, has arrived in the strategic port city of Hodeidah to discuss plans with Houthi rebels to cede control of the port to the world body and lay the groundwork for restarting peace talks. UN spokesman Rheal LeBlanc said on Friday that the international agency was ready to play a supervisory role in managing the port, which before the beginning of the war in March 2015, handled more than 70 percent of the country’s imports. Earlier this year, Abdel-Malik al-Houthi, the chief of Houthi rebels, had said he was prepared to hand over control of Hodeidah port to the UN if the Saudi-UAE military alliance halted its offensive on the city. Riyadh and Abu Dhabi see the port as the main entry point of weapons for the Houthis and have accused their regional rival Iran of sending missiles to the rebels, a charge Tehran has denied. In the past week, fighting has all but diminished with the rebels and pro-government forces, backed by Saudi Arabia and the United Arab Emirates, expressing support for the UN envoy’s plan to end the more than three-year-war. Griffiths is expected to meet with local officials in Hodeidah later on Friday, and according to UN sources will push for calm ahead of upcoming peace talks. No date has yet been set for the negotiations, but the warring parties are expected to meet in Sweden in early December. Al Jazeera’s Mohammed Adow, reporting from neighbouring Djibouti, said Griffiths and the international community were aware that “there can be no solution to the massive humanitarian crisis as long as fighting continues in places that are crucial to aid workers”. According to the World Food Programme, up to 14 million Yemenis are now at risk of starvation. Griffiths had arrived in capital Sanaa on Wednesday and met with rebel leader al-Houthi to discuss their attendance in the next round of consultations. Mohammed Abdul Salam, a spokesman for the Houthis, said in a statement on Twitter on Thursday that conditions for a ceasefire and an offer for Houthis to receive overseas medical treatment were discussed. According to the statement, al-Houthi also asked for an end to economic restrictions on rebel-held areas. Nader Hashemi, the director of the Center for Middle East Studies at the University of Denver, said the pressure was rising on Riyadh and Washington to end the war in Yemen because of the international outcry following the murder of Saudi journalist Jamal Khashoggi. The war in Yemen, the Arab world’s poorest country, started in 2014 when the government slashed fuel subsidies, prompting massive protests in Sanaa. The Houthis seized the opportunity and marched south from their stronghold of Saada province to the capital, where they toppled Hadi’s government. Concerned by the rise of the Houthis, a Saudi-led military coalition, backed by the United States, intervened in 2015 with a massive air campaign aimed at reinstalling Hadi’s government.